Summer is here. Well it actually arrived in Florida several weeks ago and the humidity along with it. Since Florida summers are much hotter and wetter than I experienced in North Carolina adjusting the products I use in my regimen could be in order. 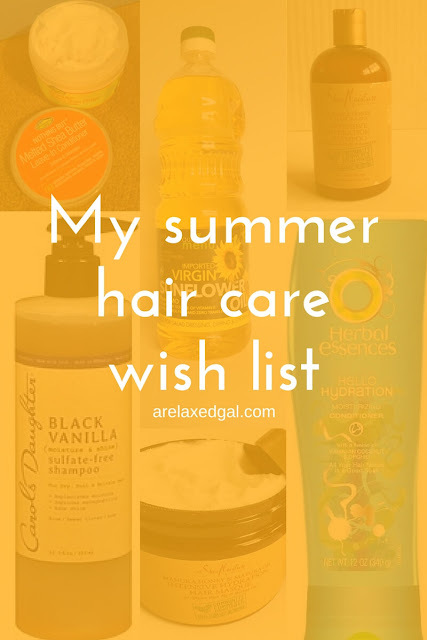 Here are some of the products I've been looking at and have put on my wish list. 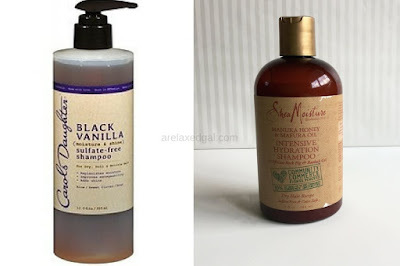 SheaMoisture Manuka Honey & Mafura Oil Intensive Hydration Shampoo: This is a sulfate-free shampoo that I have been eyeing and wanting to try for months as good moisturizing shampoos can be hard to find. The ingredient list looks amazing and very hydrating and moisturizing which is great to combat the dryness that can result from the summer heat and sun. Carols Daughter Black Vanilla Moisture and Shine Sulfate-Free Shampoo: You'll see a continuing theme throughout this wish list - moisture. This Florida sun can seriously dry out strands and have experience that from the half mile walk from my car to my office building on the few days I've worn my hair down. Despite the good reviews and interesting ingredient list, I also like the design of the bottle, it has a pump! SheaMoisture Manuka Honey & Mafura Oil Intensive Hydration Masque: As mentioned above I have been wanted to try some of the products from this SheaMoisture line for a while now. This masque, or deep conditioner, looks to have some great ingredients that are great for moisturizing hair. And while some of them are humectants, honey and glycerin, it does contain shea butter which is an anti-humectant. 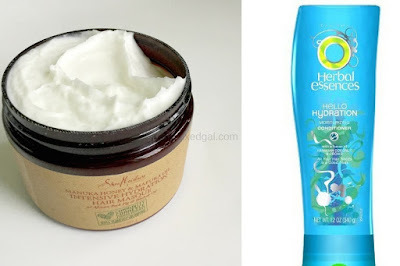 Herbal Essences Hello Hydration Moisturizing Conditioner: I have seen several bloggers rave about this conditioner, how it's good to use for a cowash and for just plain ole conditioning. I think it could be a good conditioner to coat my hair with before taking a dip in the pool or ocean. Nothing But Melted Shea Butter Leave-in: Shea butter is an anti-humectant which means it blocks all the extra water atmosphere brought on by the summer humidity. This helps keep frizz away and my new growth from reverting after tension drying it. I had been using this leave in after buying it in NC during the Christmas holiday, but haven't been able to locate it anywhere here in Florida. 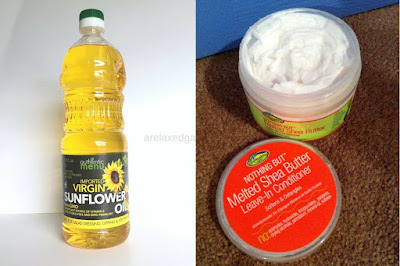 Sunflower oil: I had used this oil last summer but didn't replenish it after using it all up (not sure why). This oil has UV protection properties which is perfect for protecting relaxed tresses from the summer sun. Especially when spending time at the beach. It's also not a very heavy oil that adds softness and shine to the hair. Using the Hello Hydration before swimming sounds like a great idea. I'll have to remember that. I have two or three bottles that I need to finish up. :) And I'll have to add the Shea Moisture products to my wish list as well. They sound amazing!